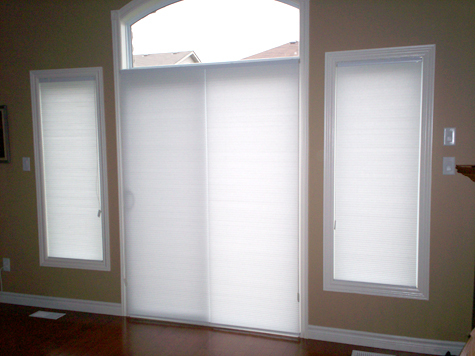 Pleated and Cellular shades both have crisp lines and soft tones. Available in a wide variety of colours and fabrics, they offer light-filtering or room darkening features. Cellular shade construction incorporates a honeycomb (cell) structure between the pleats that performs as an efficient insulator, providing superior energy efficiency. Available in single or double cell, the honeycomb (cellular) pattern is designed to trap air in the cells. This creates a layer of protection keeping you more comfortable. Cellular shades afford you the best prevention against heat loss during cold winter months. With no visible cords or unsightly cord holes, the clean lines of the cellular shade results in an appealing and uniform-looking blind with outstanding functionality. Elite™ cellular shades are available with a number of hardware and operation functions including cordless operation, cafe-style (top-down bottom-up), dual fabric eclipse shade, and continuous cord loop systems. Regardless of colour chosen, the backing of all shades is a neutral white resulting in a clean and consistent exterior profile. 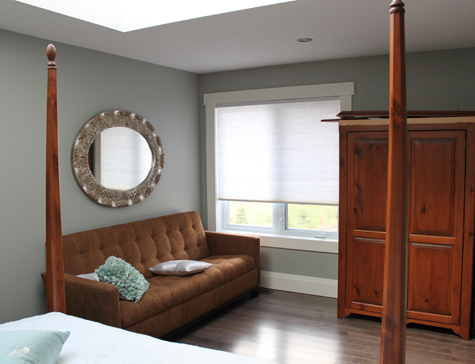 A stylish alternative, pleated shades can enhance the appearance and comfort of any room. The variety of colour and styles available make pleated shades a viable option to complement your design vision. These shades filter light, creating a nice warm glow while also providing room darkening capabilities when there is a need to block out the sun. The pleated shade does possesses insulating values but is not as efficient as the cellular shade.